Optum360 Medical coding book package for physicians including Current Procedural Coding Expert Spiral 2018 and ICD-10-CM Expert for Physicians 2018 at exclusive discount. Turn to the resource that goes beyond basic coding with the Current Procedural Coding Expert, your CPT® coding resource. 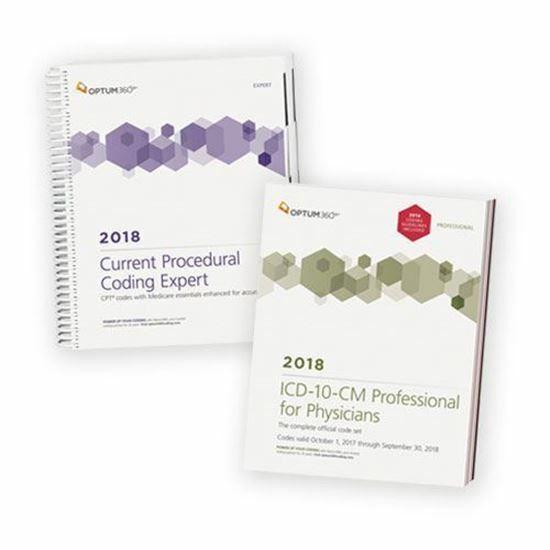 Equipped with the entire 2017 CPT® code set with easy-to-use coding includes and excludes notes for coding guidance and Medicare icons for speedy coding, billing, and reimbursement, this easy-to-navigate resource will benefit physician practices, outpatient hospitals, and ASCs. You’ll also find a comprehensive listing of annual code additions/changes/deletions/reinstatements in the appendix, new code icons and notes, plus reimbursement information and mid-year changes not found in the American Medical Association’s (AMA) CPT® code books. The ICD-10-CM Professional for Physicians with our hallmark features and format, makes facing the challenge of accurate diagnosis coding easier. Developed specifically to meet the needs of physicians, the Optum360 code book contains the complete ICD-10-CM code set which is the cornerstone for establishing medical necessity, determining coverage, and ensuring appropriate reimbursement. Now with a new symbol in the tabular to identify codes associated with hierarchical condition categories (HCC). Delivery Option 2: Updated 2018 coding guidelines bound in the book; delivery before October 1, 2017 is dependent on when the updated coding guidelines are released. Delivery may be delayed beyond the October 1, 2017 effective date.